Record numbers of exhibitors and visitors are expected at the upcoming Vision trade fair, the first show after the 2013 event was cancelled and it switched to a biennial cycle. 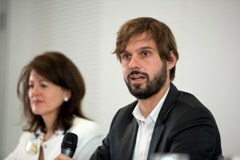 At a press conference for Vision 2014, held on 2 July in Stuttgart, Florian Niethammer, director of the Project Vision Messe Stuttgart, commented that there will be ‘a firework of innovation’ at this year’s event, when it takes place 4-6 November in Stuttgart, Germany. The change to a biennial show was, in part, to take into account longer product innovation cycles as the machine vision industry matures. Niethammer said at the press conference that ‘innovations are slowing down in the development of machine vision components’, adding that by holding the show every two years, exhibitors will have the chance to present even more of their latest products and innovations. However, questions were raised at the Vision press conference about whether the biennial cycle will open the trade fair up to competition. The SPS IPC Drives, an exhibition for electric automation which last took place in November 2013, attracted a lot of machine vision companies which were exhibiting for the first time at the show. According to the European Machine Vision Association (EMVA), this was because companies were making use of time and resources saved due to Vision not taking place in 2013. This year’s Vision has 360 registered exhibitors, a number which is expected to increase. ‘We are convinced that we will be able to reach the set target of 400 exhibitors at Vision 2014 in autumn,’ said Thomas Walter, divisional director of Industrial Solutions at Messe Stuttgart. Approximately 54 per cent of these will be international exhibitors representing 28 countries, demonstrating the ‘international significance of Vision’, added Niethammer. 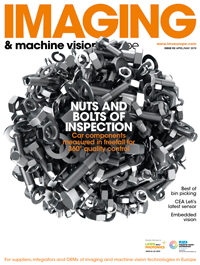 The European machine vision market grew by almost 10 per cent in 2013 and is expected to grow 12 per cent in 2014, according to figures presented by the German Engineering Federation (VDMA) Machine Vision Association at the press conference. European suppliers of machine vision components benefitted from a strong demand in both the manufacturing and non-industrial applications fields in 2013, the VDMA reported. There was an increase of 19 per cent in the non-industrial area, with intelligent traffic systems and medical technology being the largest growth sectors. The manufacturing sector, which grew by 6 per cent in 2013, is expected to maintain a healthy level of growth in the coming years due to more industrial production in European countries and the USA, and the development of manufacturing in emerging economies, according to the VDMA. Montanari also spoke on global trends that are driving the growth of the machine vision market, such as the increase of the worldwide use of automation. In addition, as countries in Asia − particularly China − are producing ever more sophisticated products, the demand for machine vision for quality assurance is also on the rise. The accompanying programme for Vision 2014 will address these strong growth sectors in the machine vision market, featuring event modules on automation, transport and computing. The ‘Traffic Vision’ conference will be the focus point, with talks on the use of machine vision in traffic monitoring, management and safety, and transport. And, the ‘Vision 4 automation’ event will consist of different events demonstrating everything machine vision can do in regard to automation. For the first time at the fair, there will be an ‘IPC 4 Vision’ stand. This will feature 11 exhibitors that are involved with industrial PCs, and will address the industry need for increased computing power to deal with higher image resolutions and fast data processing. ‘The special stand during Vision 2014 will emphasise the great importance of fast, reliable data processing and the integration of vision systems in automated production processes,’ said Walter in a statement.